and Fix it FAST -- Guaranteed! Keys to Reading Success™ provides all the services you would expect from a reading specialist. Yes, it provides fast, expert, research-based reading screening and diagnosis. But that is just the beginning. It also gives you an instant Individual Reading Plan that not only tells you the student's reading level, but tells you “why” the student reads at that level, and it clearly lists the “specific” skills the student needs to work on next. And Keys to Reading Success™ doesn’t stop there. The program provides teachers with detailed, classroom-tested lessons, metacognitive instructional strategies, and aligned materials and resources so that every teacher, regardless of grade level or subject area—even those with absolutely no background in teaching reading—can provide targeted, effective help so every student succeeds in reading. 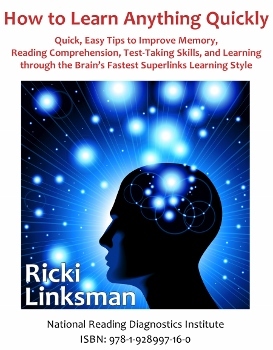 Strategies, Tips, and Proven Methods to Help Your Student or Child Become a Great Reader in the Fastest Possible Time! ASK THE READING EXPERT -- Do you have a question about reading, accelerated learning, or learning styles that you would like answered? Browse though questions and answers already on the site or ask a question of your own! Click here to order our line of products and resources and start helping your child improve reading and learning. Teachers, Administrators, Tutors, parents and students share the joy of reading success -- especially when all other approaches have failed. Ongoing, job-embedded Professional Development is critical to successfully implementing school-based programs. Learn how Keys Learning supports implementation by providing research-based strategies and caring support.